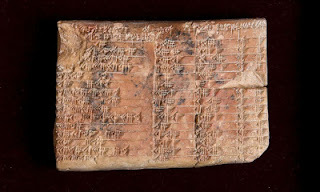 An ancient Babylonian tablet contains the world's oldest trigonometric table; but not only that.... it is also the only COMPLETELY ACCURATE trigonometric table, because of the very different Babylonian approach to arithmetic and geometry (using the base 60 instead of base 10). This tablet uses simpler, yet more accurate trigonometry that has clear advantages over our own modern version. It's based on ratios instead of angles and circles. It is rare that an ancient discovery could be teaching today's mathematicians something new but that seems to be the case here! I'm sure many students would welcome a simpler approach to trigonometry!